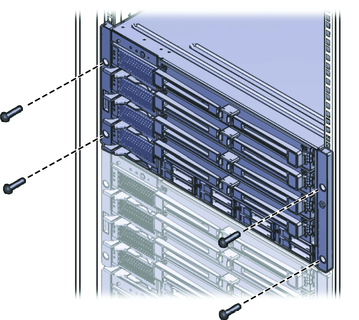 The following procedure explains how to insert the server into the rack and on to the shelf rail assemblies on the rack. Perform the steps in How to Install the Standard Rack Mounting Hardware in a Rack. Lift the server to its position on the rack. Caution - The server weighs 180 pounds (82 kg). 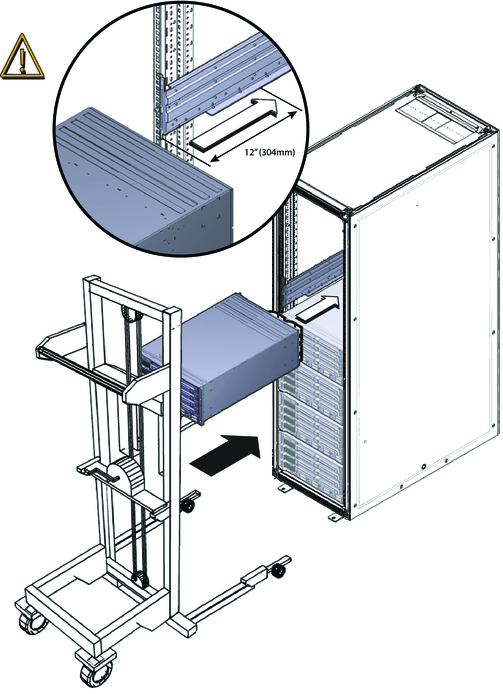 To reduce the risk of serious personal injury or equipment damage, use a mechanical lift to install the server into the rack. If a lift is not available, remove components as instructed in How to Remove Components to Reduce Weight and use two persons to lift the server into place. Use four screws to attach the front of the server to the front of the rack. Use either the M6 x 25, or the 10-32 x 1 screws. On a threaded rack, use four M6 x 25, or four 10-32 x 1 screws. On a square-hole rack, use four M6 x 25 screws. If you removed components from the server, replace them after it is mounted in the rack. See How to Remove Components to Reduce Weight.